Have you or a loved one been injured by an accident that was not your fault? Are you facing medical bills to recover from your injuries that you can’t afford to pay? Are you worried about how you’re going to put food on the table and pay your bills because your injuries have left you unable to work? You need the Cincinnati personal injury attorneys of Lawrence & Associates. Our team of experienced and award-winning attorneys are only a phone call or email away from fighting to get you the justice you deserve. 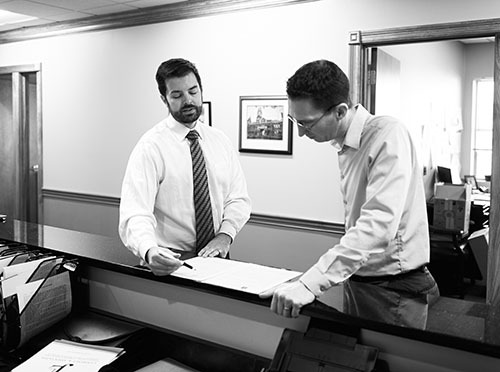 Contact us today at (513) 351-5997 to schedule a free consultation of your case. Having a personal injury lawyer to pursue your claim is the best way to ensure you receive the maximum recovery for your injuries. Insurance companies and lawyers for the other side are focused on minimizing their client’s liability or even to get you to accept responsibility for your accident. With the personal injury lawyers of Lawrence & Associates by your side, you’ll have experts who will stand up to the insurance companies and the big law firms to make sure you are fully compensated for your losses. Personal injury lawyers are experienced in dealing with insurance companies and opposing counsel, and they can make sure that you don’t sign your rights away or are stuck with a lowball offer. If your case ends up in the courts, a personal injury attorney is critical to ensure your case is pursued diligently and that you do not lose any rights. An attorney will make sure that your case is filed quickly and that the proper parties are served with notice and process. Your attorney will be experienced in court procedures and will be able to respond to notices from the court and motions by the other parties. Finally, your attorney will expertly and vigorously present your case to a judge or a jury. You have the best chance of success with a personal injury lawyer on your side. With your case in the hands of an experienced personal injury lawyer, you can feel confident that your interests are being well-represented. Your attorney will aggressively pursue the compensation that you deserve for medical bills, lost wages, and other damages, dealing with the other party’s insurance company or and lawyer while you focus your time and energy on recovering from your injuries. The personal injury attorneys of Lawrence & Associates will take over your case. We bring our resources and years of experience to thoroughly investigate your claim and your accident, building up a case of evidence that will be critical to proving the other party’s responsibility for your injuries. We will also begin collecting proof of your expenses, such as your medical bills and lost wages, as well as determining the future expenses that will result from your injuries. With a strong case in hand, we’ll stand up to the insurance companies and demand just compensation. At Lawrence & Associates we focus on client satisfaction and service. We’ll always be responsive to your needs and keep you informed throughout the process. We never charge consultation fees, we’ll respect your time, and we will deliver results as efficiently and quickly as the justice system allows. If you or your loved one was injured as the result of another’s negligence, contact the personal injury attorneys of Lawrence & Associates to get help today. Will it cost anything to hire an attorney? At Lawrence & Associates, we accept personal injuries cases on a contingency basis. That means that you don’t have to pay us anything unless and until we obtain compensation for you. If we obtain a settlement for you or take your case to trial and we win, our fees, case expenses, and court costs will be paid out of your settlement or judgment. In some cases, more than one party may be responsible for your injuries. For example, if you were in a car accident and the safety features of your car did not perform as intended (and those defects are determined to have made your injuries worse), you might be able to obtain recovery from your car’s manufacturer as well as from the other driver(s). How long will it take to recover damages? The attorneys of Lawrence & Associates will work diligently to resolve your case so that you are made whole as quickly as possible. If the other side accepts liability, it is often simply a matter of calculating damages and getting the other party to agree to a settlement figure. Sometimes it may be necessary to pursue your claim in court. In those cases, it may take months to resolve your case, and we'll work to get compensation as quickly as the court system allows. Never accept a settlement from an insurance company without first speaking to a personal injury attorney. The insurance companies know you may have lost time from work and now have medical bills and other expenses you can’t afford to pay. They are banking on the fact that you need cash right now. Treatment for your injuries might require future medical expenses that you aren’t even aware of yet, or you may not know when (or if) you’ll be healthy enough to go back to work. A personal injury attorney can evaluate your case and advise you whether you’ve received a reasonable settlement offer. What happens if I’m found partially at fault for my accident? In Ohio, the court uses a system known as comparative or contributory negligence. Under that system, a jury is asked to assign a percentage of fault to the plaintiff and the defendant. Each party is then responsible for their percentage of the plaintiff’s damages. So if a defendant is found to be 90 percent responsible and the plaintiff is found to be 10 percent responsible, the defendant only pays 90 percent of the plaintiff’s damages. Moreover, in Ohio, if a plaintiff is ineligible to recover compensation if they are found to be more than 50 percent responsible for their injuries. Every year, millions of people in the United States are injured due to someone else’s actions or negligence. According to the National Safety Council, in 2017 motor vehicle incidents resulted in 4.6 million medically consulted injuries. Total motor vehicle injury costs that same year was estimated at $433.8 billion. Locally, in Ohio, the State Highway Patrol reports that there were 19,376 crashes in 2017 that resulted in injury or fatality. Consumer products likely cause even more injuries. The National Safety Council reported that in 2017, 10.5 million people were treated in emergency departments for injuries caused by consumer products. Within that number, approximately 3.1 million injuries were caused by stairs, ramps, landings, and floors. Although some consumer product injuries are caused solely by user error, the National Safety Council also reports that children aged 0 to 4 have the highest injury rate of any age group. If you or a loved one are recovering from injuries caused by someone else’s actions or negligence, contact the personal injury attorneys of Lawrence & Associates at (513) 351-5997. Our team of dedicated, experienced, professionally recognized lawyers is ready to go up against the insurance companies and defense lawyers to get you the compensation you deserve. Don’t waste another minute fighting alone. Let us take on the work of getting financial recovery for your injuries while you focus on what’s really important to you — getting better and getting back to your life and your family.